First things first - Congratulations on your engagement!! I’m so happy for the two of you! (Insert all the emojis here!) As you begin making all the big decisions for your wedding let us help set the vibe for your guests. We believe there is no celebration to small, or to large, for beautiful heirloom wedding invitations, and one of a kind calligraphy. I’m sure you’ve heard it before, but this sentiment is something that we truly believe. Invitations set the tone for your entire wedding, and they are the very first glimpse your guests will get of your big day. We would love to help you and your fiancé make them something personal that truly reflects your unique personalities. Let’s create something that your guests will want to hold onto forever! From one of a kind hand-calligraphed envelopes to hand painted signature cocktail signs we want your wedding to be as unique as your love story. Whether you met online, at a local coffee shop or on an airplane over the Atlantic your story is unique to you. Let us infuse the little details of your love story to create stationery that is “so you”. We want to know everything from the first day you met, to how you got engaged! We truly believe that your love story matters, and should be celebrated! 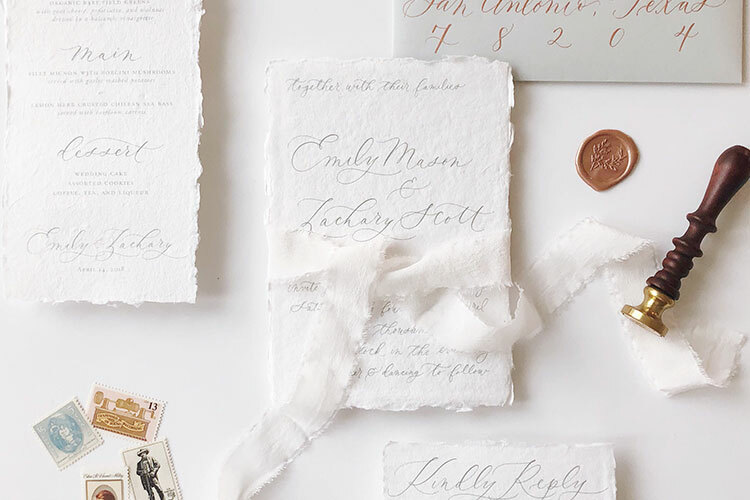 Custom design can make your wedding stationery dreams a reality. With your love story as inspiration we can create a unique design that will “Wow” your closest friends and family! Do you love the unique architecture of your venue? Let’s add a custom venue sketch! Do you want a custom hand-drawn map for your guests? We can do that too! We want to design something for you and your fiancé that that will tell YOUR story. DWC brides can expect to spend anywhere from $1,600 to $5,000+ for 100 custom invitation suites (invitation + envelope, RSVP card + envelopes and 1 additional details card), but pricing will vary greatly depending on quantity and additional pieces such as maps, envelope liners, ribbon, wax seals, envelope addressing and any other embellishments you might have in mind. After we get all the information from your questionnaire, we will be able to provide you with a detailed quote made specifically for you. All of our custom invitations include custom calligraphy, and hand painted watercolor elements so that your invitations will be one of a kind. Just like you, and your fiancé! We suggest securing your spot on our design calendar as soon as possible! You want to give you guests plenty of time to clear their schedules so that they can make sure they are able to attend your wedding. With that being said, Save the Dates should be sent out 6 months before your wedding day, and 8 months prior if you are planning a destination wedding. Typically, design will begin at least 3-4 months before your mailing date for wedding invitations, 1-2 months prior if it's day-of event signage or calligraphy. This allows for design, proofing and printing time for printed materials, and design time for calligraphy projects.